William Branham believed that this passage taught if Christians did not walk in the light for their age, there was no forgiveness for sins. But is this what scripture really teaches? 2 What does 1 John 1:7 mean? The Bible does not contain the phrase - "the light of the hour". Neither does it refer to the "light of the age", "word of the hour" or other similar expressions that were used by William Branham (see quotes below). These phrases that were so important to William Branham, in fact, have no basis in scripture. There is something wrong with your experience, when you say that you love God and refuse His Word. There is something. You refuse the very… No wonder the things can't, the church is in its condition, and things cannot be done as God promised, is because you won't even receive the Word or walk in the Light. 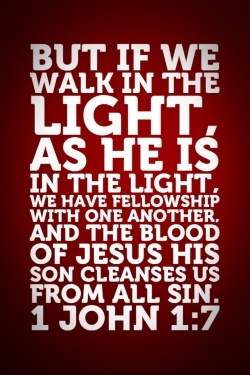 The Bible said, "Let us walk in the Light, as He is in the Light, then the Blood of Jesus Christ, God's Son, cleanses us from all sin." Sin is "unbelief." William Branham even dared to compare himself to Jesus Christ. He called Jesus Christ the "light of the hour" and then he went on to tell everyone that the message of William Branham was the message of the hour for today. Yes, sir, they believed, all the way along. So does Satan. Those Pharisees, who could condemn them, not believing? But they didn’t believe the Word for the hour. They were worshiping the glare of something else. It’s the same thing they’re doing today. See? They’re keeping up Luther’s predict-…traditions, or—or Wesley’s traditions, and the rest of them, the Pentecostal tradition. But what of the hour? And to you man that's listening to this, across the world, wherever you may be. There is something wrong with your experience, when you say that you love God and refuse His Word. There is something. You refuse the very… No wonder the things can't, the church is in its condition, and things cannot be done as God promised, is because you won't even receive the Word or walk in the Light. The Bible said, "Let us walk in the Light, as He is in the Light, then the Blood of Jesus Christ, God's Son, cleanses us from all sin." Sin is "unbelief." Then if we are walking in the God-given Light of the hour, then God takes that Word that's given for the hour and vindicates It. He was the same One was in all the apostles. And He is the same One that was in Jesus Christ, to manifest Himself there for that promised Word. And He is the same God today, the same Word, throwing Light upon the Word of the hour. God be merciful to us! Yes, sir. Believing God to interpret Himself, every Word to be vindicated! Yes, He is His Own interpreter. The prophets were part of the Word. Jesus said they were called 'gods.' And they were, as long as the Word of God was brought to them. He said, "How can you condemn Me when I say I'm the Son of God? And—and, you, those… It's written in your law, 'those who the Word of the Lord come to,' you called them 'gods.'" See, the… It wasn't the prophets; it was the Word of God. And it's same thing now. And it was Jesus, same thing, the Word of God made manifest. And that is always the Light of the hour. And the greatest robbery that the church of Jesus Christ ever had, is a false light, a glare of some other age, when God is trying to inject, or project, to the people, the Light of the hour. In every church age we hear these words, “He that hath an ear, let him hear what the Spirit saith unto the churches.” The Spirit gives the Word. If you have the Spirit you will hear the Word for your age, as those true Christians took the Word for their age. ↑ The Holy Bible: English Standard Version (Wheaton: Standard Bible Society, 2001), 1 Jn 1:7. This page was last edited on 25 August 2018, at 22:13.